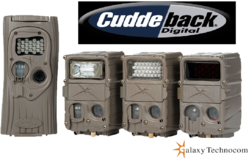 We are a leading Wholesale Distributor of cuddeback ir cameras from Hyderabad, India. We feel immensely pleased to introduce ourselves as a dependable wholesaler, distributor, importer, exporter and supplier of Cuddeback IR Cameras. These cameras are made by using best quality of material & advance techniques. Offered cameras take crystal clear images day or night. Also, our vendor’s adroit team of quality controllers checks these cameras to ensure a defect free delivery at the clients' end. Dimensions: 11.5" x 6.8" x 5"
Power Supply: 4 D batteries. Contents: 1 Cuddeback Attack IR Game Camera 1156. Looking for IP Security Cameras ?